I hope nothing happens to this kids Pop who, according to him, allowed him to post pictures of him playing it. Part of a secretive chatter building campaign or just the kid hoping to keep his family out of Microsoft's line of fire? Hmm. Either way, thier willingness to risk their job and financial security means happy info for us! 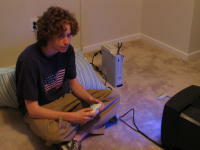 By word of this crafty teen, the power supply is not small and his pop is in charge of making sure it doesn't explode. In these pics he's playing Halo 2 so backwards compatibility must be somewhat working. He also says good things about the boot up screen and it's ability to stream music from your pc. So, where does your father plan on working next?